The family amenity specs at the Pointe Hilton Squaw Peak are impressive when seen online: 563 all-suite accommodations including a separate living room, two flat-screen TVs, and a queen-sized sofa bed; two-story casitas with even more sleeping room plus 224 Agave Suites at North Pointe with a concierge and dedicated pool; terrific kids club; and a 4-acre River Ranch water park that features a winding lazy river, waterslide, and mini golf. And the reality at this Phoenix, Arizona resort is just as good. The water park at the Pointe Hilton Squaw Peak resort is fun for all ages. We recently spent four nights at the hotel for the annual TMS Family Travel Summit, a think tank-style gathering of media and travel industry executives discussing multigenerational travel. Not only do my colleagues feel like family, but most of the attendees were avid family travelers as well, and good judges of family resorts. So how does the Pointe Hilton Squaw Peak stack up on the Multigen-ometer? Our travel industry think tank identified a few key requirements to make multigenerational vacations successful, and the Pointe Hilton does them all well. Here’s our scorecard. 1. Multigenerational families love activities for all ages to enjoy together. 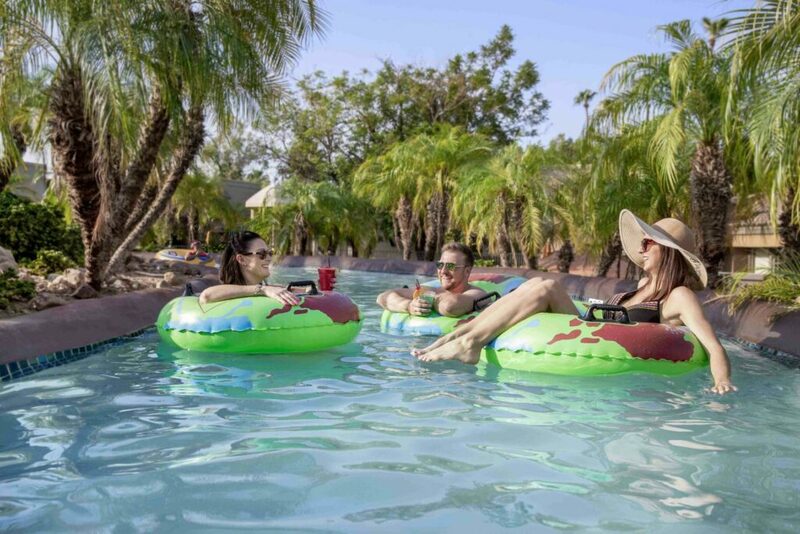 The Pointe Hilton Squaw Peak has several swimming pools where guests can choose between active and noisy — like the fun River Ranch waterpark, or quiet and convenient — like the pools outside both the South and North Pointe hotel room wings. Additionally, the resort schedules several family-together activities like making and baking little flour and water animal sculptures while waiting for your delicious “low and slow” cooked barbecue at the Hole-in-the-Wall restaurant. 2. Expert childcare so adults and kids have time apart with peers, or just to relax. Coyote Camp Kids for ages 4 to 12 meets daily from 9am from 4pm; the fee is $65 for a full day or $35 for a half-day of making arts n’ crafts, cooking, pool play and games. Wednesday through Saturday night each week, from 6pm to 9pm, Parents Night Out ($35) encourages parents to enjoy a meal at the American bistro Rico’s while kids are enjoying dinner and a movie together. The on-site Tocasierra Spa has a variety of adult fitness classes and beauty treatments like their Signature Facial, as well as Sparkle Spa Parties for ages 5-12 and Teen Queen combination treatments for ages 12-17. 3. Multigenerational travelers want a safe and secure place to vacation. The Pointe Hilton Squaw Peak is in a planned community just 20 minutes from the Phoenix Sky Harbor Airport. Friendly and helpful staff and security are around to offer a golf cart ride or, in one case, provide medical care to someone who fainted from dehydration (a more common occurrence than you might think). A jogging and bike path within the community leads past hotel facilities, condos, beautiful homes and recreation facilities, while cars remain on the perimeter. Although there are no lifeguards on duty at the many pools, the resort plays a water safety video on their closed circuit TV system with water safety tips to remind parents how dangerous a pool can be. 4. Value for money and extra family perks are always delightful surprises. Phoenix and neighboring Scottsdale have many, many fine five-star resorts and country clubs where money is no object. But what we learned from the TMS Summit is that multigenerational groups, regardless if parents or grandparents are paying for the children, shop the four-star properties and rate “value” as a top priority. This could be because they are such a large group and will stay longer than the average hotel guest, or because a group of several families may have different budgets to work with on vacation. Therefore, having room nights priced at half the rate of many other resorts nearby, makes the Pointe Hilton a good value. Seasonal events such as a jelly bean taste testing contest over Easter, or weekends when local animals are brought in to create a petting zoo at no extra charge, are the type of thoughtful family amenity that turns family vacations into family traditions, repeated year after year. 5. A learning experience or family adventure where memories are made. A learning experience or family adventure where memories are made and ties are formed are extra important to multigenerational travelers. Multigenerational or extended family vacations, even more than parent-child ones, succeed when there’s an opportunity to learn something new or share family lore with the younger ones. At Pointe Hilton, which has been a fixture of Phoenix resort life for many years, you can pose for a “Most Wanted” sepia toned photo with the kids, take a guided hike into the desert, watch a classic kids film during the Friday night Dive-In Movies by the pool, work on puzzles and join an Arizona Trivia contest. Just outside the property, families can explore the delightful Musical Instrument Museum nearby, or visit the Heard Museum to admire Native American art. Need we say more to the family vacation planners out there? If you’re not convinced, here’s a video we did at the resort. For more information or to book your next stay, visit Pointe Hilton Squaw Peak or call them at 602/997-2626, The resort is located at 7677 N 16th Street, Phoenix, Arizona 85020. Nice Blog. Thanks for sharing a family resort.